The iconic Volkswagen Golf twice voted European car of the year deserves its’ status as one of the best hatchbacks ever. In the family car category the Golf leads the way time and time again. With a comfortable ride, excellent refinement and a surprisingly spacious interior cabin the Golf ticks all the boxes. Not to mention value for money and also one of the strongest resale values of any car. Available in 6 versions from the entry level Golf S which can return up to 74.3mpg to the hot hatch award winning Golf R-Line Edition which despite it’s obvious sports car status can return up to 65.7mpg itself and go 0-62mph in just 8.2 seconds. The interior as you would expect from a Volkswagen Golf is plush and modern, boasting a 5.8-inch touchscreen control to manage all entertainment and communications and make your time behind the wheel more comfortable. Bluetooth phone connectivity is standard as is sat-nav. The exterior is the timeless Golf design with a new subtle upgrade. Halogen lights lead the way and body coloured bumpers provide a sport look even on the entry level model. The boot space is more than ample enough at 380 litres. Safety is well taken care of with automatic cruise control, emergency city breaking, parking sensors and driver alert system all as standard. 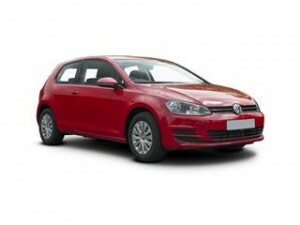 Known for being great value for money the Volkswagen Golf is renowned for being a great money saver. Coast2Coast Cars could even save you more on the dealers list price. You can choose the spec of your choice too. Our online quote service takes just a few moments and you get a displayed price online too.